Eat what’s in season. Eat organic. Jackfruit is one of tropical fruits, recognized for its unique size, shape, and fruity flavour. This fruit is sweet and delicious in taste. Like other tropical fruits such as banana, durian etc., jackfruit is also rich in minerals, vitamins, energy, dietary fiber, and free from cholesterol and saturated fats. The Jackfruit is normally eaten raw, as a snack/ sweetener or in desserts. It is also dried and made into chips, or cooked and added to curries. You can also find buns, cakes, cookies, and ice cream with Jackfruit taste. These products are very popular among Asians. 100 g of Jackfruit provide 95 calories. The fruit is made of soft, easily digestible flesh (bulbs) with simple sugars like fructose and sucrose that when eaten replenishes energy and revitalises the body instantly. These compounds are perfect antioxidants and are good for maintaining functionality of the eyes. Vitamin A is capable of keeping the mucous membranes and skin healthy. It has been confirmed that fruits rich in vitamin a and beta-carotene can effectively lower the risk of lung disease and oral cancer. Fresh Jackfruit is a good source of iron, potassium, & magnesium. Potassium is an important component of cell and body fluids that helps controlling heart rate and blood pressure. 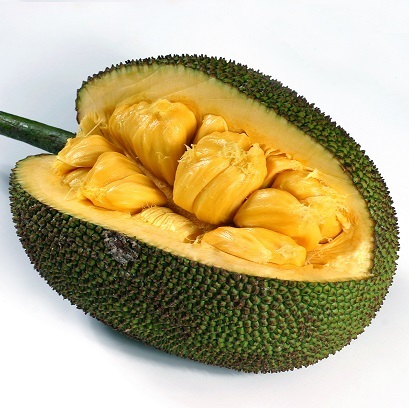 Most of us are unknown about the valuable benefits of Jack fruit seeds. While we consume Jackfruit due to its taste and aroma, we normally throw away its seeds, which are like gravels. Jackfruit seeds are indeed very rich in protein and nutritious. Skin and eye care: Jackfruits contain powerful anti-ageing properties that slow down the degeneration of skin cells and make the skin look younger. They are a rich source of vitamin A that is essential in maintaining healthy eyesight. Bone health: Jackfruits are also effective in maintaining good bone health. They are rich in magnesium that helps in the absorption of calcium and strengthens the bones. Anaemia: Jackfruits being a rich source of iron help in preventing anaemia and improving blood circulation in the body. jackfruit are effective in controlling asthma and alleviating the symptoms associated with this condition.